My simple pilau rice is ready in less than 30 minutes with about 2 minutes hands on time. Never buy ready made or order take out again with this easy fakeaway recipe. Make a double batch and freeze for another day. Naturally gluten free and vegan. What sort of rice should I use to make Easy Pilau Rice? Can I make Homemade Pilau Rice Ahead? Can I Freeze Easy Pilau Rice? Pilau (or pilaf) rice is so much more interesting than plain boiled rice. Spiced with cardamom, cumin, turmeric, cinnamon and bay leaves, it’s a delicious accompaniment to both spiced, curry dishes and un-spiced, savoury main dishes. Originating in India, pilaus can contain meat but they certainly don’t have to. This is a great side dish, with the spicing and glorious vibrant yellow colour adding interest and flavours to a meal. I’m a big fan of making my own fakeaway dinners rather than calling up a delivery. It means I know how healthy the meal is, I can adjust the flavours to how I like them, and it saves so much money! 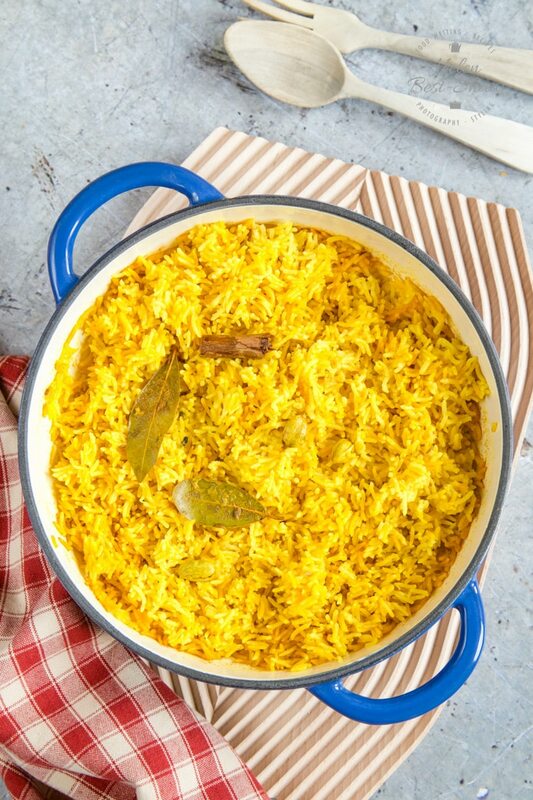 This easy pilau rice is a perfect example. It takes 30 minutes – less time than the take away takes to deliver on a busy evening – and of that, only about 2 minutes is hands-on cooking. Any long grain rice will do, but don’t use a quick-cook version, as you’ll end up with a mushy, sticky mess. You’ll get a better result if you use Basmati rice, which is much more flavourful and fragrant than plain long grain rice. Even better, if you can get it, is aged Basmati rice. This is such a simple recipe – fry the spices, add the rice (twice the volume of liquid to rice) cover and cook! 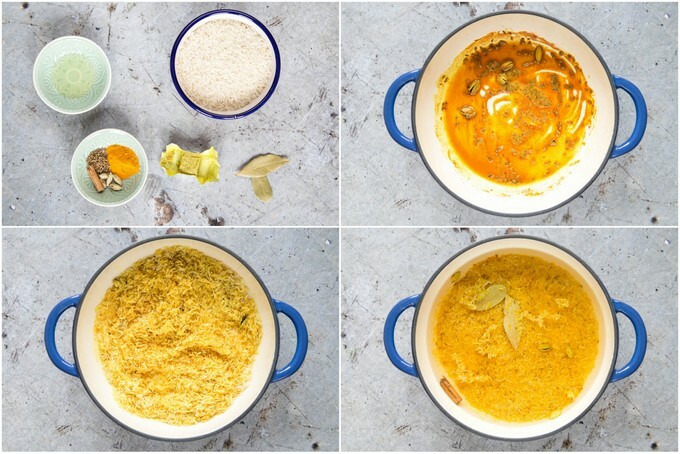 Step One – Gather your ingredients – I know I say this every time, but it is so easy to leave something out – I’ve put a cake in the oven before and immediately realized that I forgot the sugar and had to scrape it all out the pan, added sugar and put it back in the oven to cook. Step Two – Pour the oil into the bottom of a heavy saucepan, or casserole dish (Dutch oven) and heat over a low flame. Crack the cardamom pods – the best way to do this is on a chopping board with the side of a heavy knife. Add the cardamon, turmeric and cumin and fry for a minute until fragrant. Step Three – Add the rice and stir until it is coated with the spice and oil mixture. Step Four – Pour over the stock, add the bay leaves and cinnamon stick and give a quick stir. Add a little salt. Bring to a gentle simmer, put the lid on the pan and leave on the lowest heat for 25 minutes. Step Five – After 25 minutes take the pan off the stove top. The freshly cooked pilau rice would have absorbed all the liquid. Fluff the rice with a fork, replace the lid and allow to stand for up to 15 minutes. If you have used a heavy pan it will keep warm for this time. 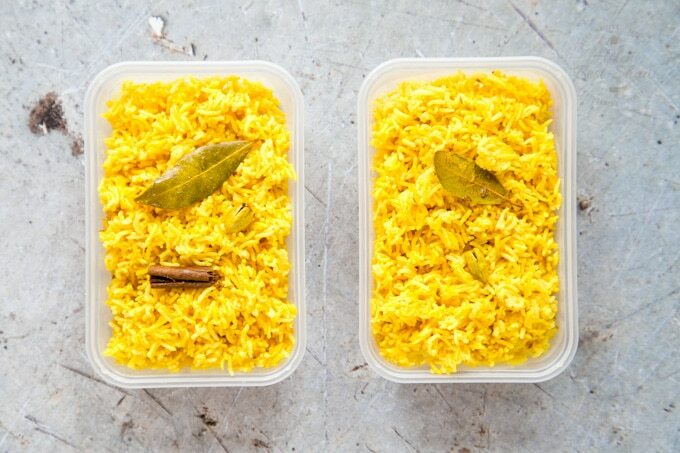 Once you make this fakeaway pilau rice you will never order rice with your Indian takeaway again. You can make onion pilau rice by finely chopping an onion and fry with the spices at step one. You can of course use different spices, I sometimes throw in half a lemon rind to make lemon rice. 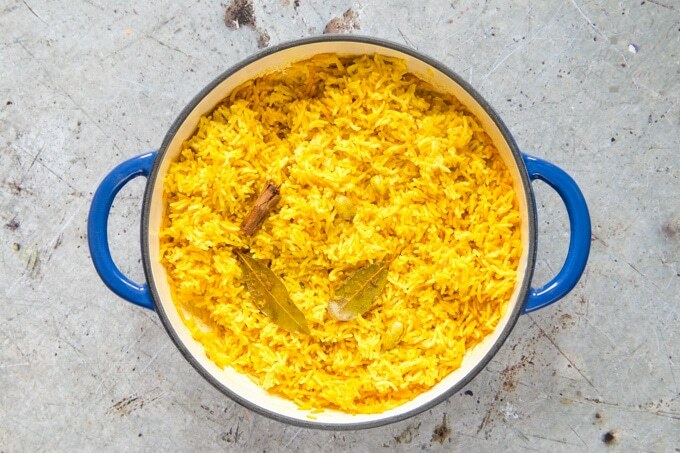 I make my easy pilau rice in a heavy cast iron casserole or Dutch Oven. Use the heaviest pan you have. A sturdy pan heats evenly and will prevent hot spots and burning. Use a pan with a well fitting lid. If the lid doesn’t fit properly then some steam will escape and you might end up with dry rice. If the lid isn’t tight add a extra spoon of water. Cook on the lowest heat and if needed use a stove top heat diffuser or simmer ring – these cost a few pounds or dollars and will last a lifetime. You can make this ahead, and it will reheat in the microwave, but it is so easy there is no need to make this ahead. If you do make sure the rice is cooled, keep in the fridge for no more than 48 hours (I never keep cooked rice in the fridge for more than a day) and reheat thoroughly before serving. I’m a big believer in cook once and eat twice and this recipe has been written to make a double portion that will exactly fill two standard plastic takeaway trays. Pack leftovers into a takeout tray, allow to cool and then freeze. Grab a tub from the freezer and defrost in the fridge, or microwave from frozen. If you are an electric pressure cooker fan then try my Instant Pot pilau rice. If you try this Easy Pilau Rice please tag #FussFreeFlavours on Instagram or Twitter. It is amazing for me when for me when you make one of my recipes and I really do love to see them. You can also share it on my Facebook page. Please pin this recipe to Pinterest too! Thanks for reading Fuss Free Flavours! 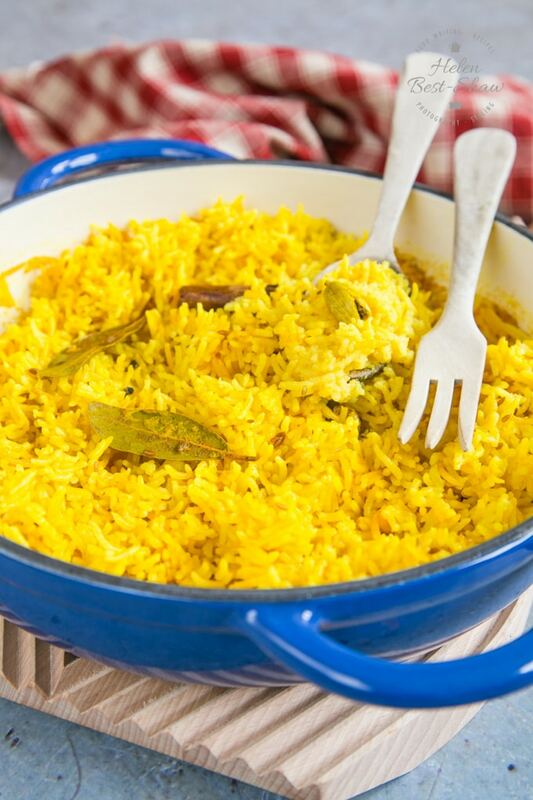 My easy pilau rice is ready in less than 30 minutes with about 2 minutes hands on time. Never buy ready made or order take out again. Make a double batch and freeze for another day. Serves 4 as the main side for an Indian meal, or 6 if you are also having bread. Pour the oil into the bottom of a heavy saucepan, or casserole dish (Dutch oven) and heat over a low flame. Crack the cardamom pods - the best way to do this is on a chopping board with the side of a heavy knife. Add the cardamom, turmeric and cumin and fry for a minute until fragrant. If you are making onion pilau rice add a finely chopped onion along with the spices and cook with them until soft. Pour over the stock, add the bay leaves and cinnamon stick and give a quick stir. Add a little salt. Bring to a gentle simmer, put the lid on the pan and leave on the lowest heat for 25 minutes. After 25 minutes take the pan off the stove top. The rice would have absorbed all the liquid. Fluff the rice with a fork, replace the lid and allow to stand for up to 15 minutes. 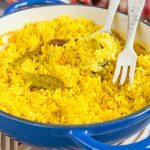 I make my easy pilau rice in a heavy cast iron casserole or Dutch Oven. Use the heaviest pan you have. A sturdy pan heats evenly and will prevent hot spots and burning. It wil also keep the rice warm for longer at the end of cooking. Use a pan with a well fitting lid. If the lid doesn't fit properly then some steam will escape and you might end up with dry rice. If the lid isn't tight add a extra spoon of water. Cook on the lowest heat and if needed use a stove top heat diffuser or simmer ring - these cost a few pounds or dollars and will last a lifetime. Make ahead, cool and keep in the fridge for no more than 48 hours. Leftovers can be frozen - Pack into an empty takeaway container, allow to cool and then freeze. GET EASY, TASTY RECIPES FOR FREE WHEN YOU SUBSCRIBE!